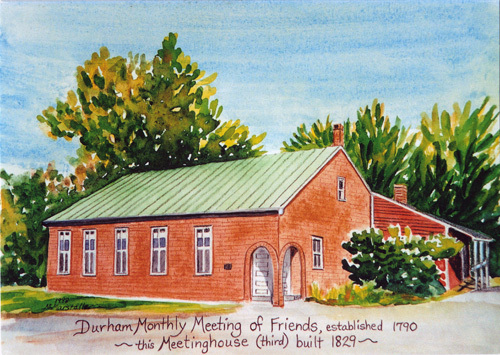 The Durham Friends Woman’s Society met on April 18 at Clarabel Marstaller’s home. Ten women attended. Bee Douglas led devotions, emphasizing the many ways she has felt cared for by her family and f/Friends. Theresa Oleksiw gave the program on care of the elderly. Her presentation of the Blueprints information led to much sharing among the group. In business, we were asked to pray for Ann Riggs, Principal of Friends Theological College, and her excellent work in Kenya. We had no report on the April Tedford meal. Team F has the May meal. Five Easter pies were ordered. Their baking and delivery to meeting was coordinated. The Yard Sale is set for Saturday, May 28. The plans for advertising were discussed. We noted that the box of toiletries for Japan is filling nicely. Jo-an Jacobus presented information about the Durham Friends Meeting website and we clarified contact information to be used on the site for our group. We appreciate the good work Markus Schlotterbeck and the website committee have done in setting it up, and are grateful for Jo-an’s willingness to keep it up to date. Six women from our Meeting attended and enjoyed the USFW NE Spring Gathering in Portland. USFWI has asked if New England could host the 2016 Triennial. After discussing the information laid out in the Handbook on hosting those events, as the only organized Woman’s Society in New England, we decided we are not ready to attempt the task. The 2011-2012 Blueprints have arrived and are available from Margaret for $5 each. Our next meeting will be May 16 at the home of Nancy Marstaller. Theresa will lead devotions and Sarah Sprogell will lead the program. Dorothy closed the meeting with some wildly hilarious quotes from church bulletins, and we adjourned to feast on Clarabel’s delicious goodies. This entry was posted in Committee Reports, Woman's Society News and tagged Blueprints, USFW NE. Bookmark the permalink.